SAP HANA Database is Main-Memory centric data management platform. SAP HANA Database runs on SUSE Linux Enterprises Server and builds on C++ Language. SAP HANA Database can be distributed to multiple machines. SAP HANA is useful as it’s very fast due to all data loaded in-Memory and no need to load data from disk. SAP HANA can be used for the purpose of OLAP (On-line analytic) and OLTP (On-Line Transaction) on a single database. SAP HANA Database consists of a set of in-memory processing engines. Calculation engine is main in-memory Processing engines in SAP HANA. It works with other processing engine like Relational database Engine(Row and Column engine), OLAP Engine, etc. Relational database table resides in column or row store. There are two storage types for SAP HANA table. Row type storage (For Row Table). Column type storage (For Column Table). Text data and Graph data resides in Text Engine and Graph Engine respectively. There are some more engines in SAP HANA Database. The data is allowed to store in these engines as long as enough space is available. Data is compressed by different compression techniques (e.g. dictionary encoding, run length encoding, sparse encoding, cluster encoding, indirect encoding) in SAP HANA Column store. When main memory limit is reached in SAP HANA, the whole database objects (table, view,etc.) that are not used will be unloaded from the main memory and saved into the disk. These objects names are defined by application semantic and reloaded into main memory from the disk when required again. Under normal circumstances SAP HANA database manages unloading and loading of data automatically. However, the user can load and unload data from individual table manually by selecting a table in SAP HANA studio in respective Schema- by right-clicking and selecting the option “Unload/Load”. It contains actual data stores and the engine for processing the data. Index Server processes incoming SQL or MDX statement. 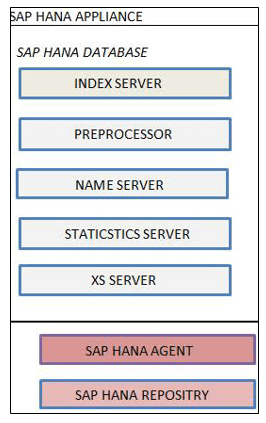 Below is the architecture of Index Server. 1. Session and Transaction Manager: Session Component manage sessions and connections for SAP HANA database. Transaction Manager coordinates and control transactions. 2. SQL and MDX Processor: SQL Processor component queries data and send to them in query processing engine i.e. SQL/SQL Script / R / Calc Engine. MDX Processor queries and manipulates Multidimensional data (e,g. Analytic View in SAP HANA). 3. SQL / SQL Script / R / Calc Engine: This Component executes SQL / SQL script and calculation data convert in calculation model. 4. Repository: Repository maintain the versioning of SAP HANA metadata object e.g. (Attribute view, Analytic View, Stored procedure). 5. Persistence layer: This layer uses in-built feature “Disaster Recovery” of SAP HANA database. Backup is saved in it as save points in the data volume. This server is used in Text Analysis and extracts data from a text when the search function is used. This Server contains all information about the system landscape. In distributed server, the name server contains information about each running component and location of data on the server. This server contains information about the server on which data exists. Statistic server is responsible for collecting the data related to status, resource allocation / consumption and performance of SAP HANA system. XS Server contains XS Engine. It allows external application and developers to use SAP HANA database via the XS Engine client. The external client application can use HTTP to transmit data via XS engine for HTTP server. “HANA” mean High Performance Analytic Appliance is a combination of hardware and software platform. Due to change in computer architecture, the more powerful computer is available in terms of CPU, RAM, and Hard Disk. SAP HANA is the solution for performance bottleneck, in which all data is stored in Main Memory and no need to frequently transfer data from disk I/O to main memory. Below are SAP HANA Innovation in the field of Hardware/Software. There are two types of Relational data stores in SAP HANA: Row Store and Column Store. It is same as Traditional database e.g. (Oracle, SQL Server). The only difference is that all data is stored in row storage area in memory of SAP HANA, unlike a traditional database, where data is stored in Hard Drive. Column store is the part of the SAP HANA database and manages data in columnar way in SAP HANA memory. Column tables are stored in Column store area. The Column store provides good performance for write operations and at the same time optimizes the read operation. 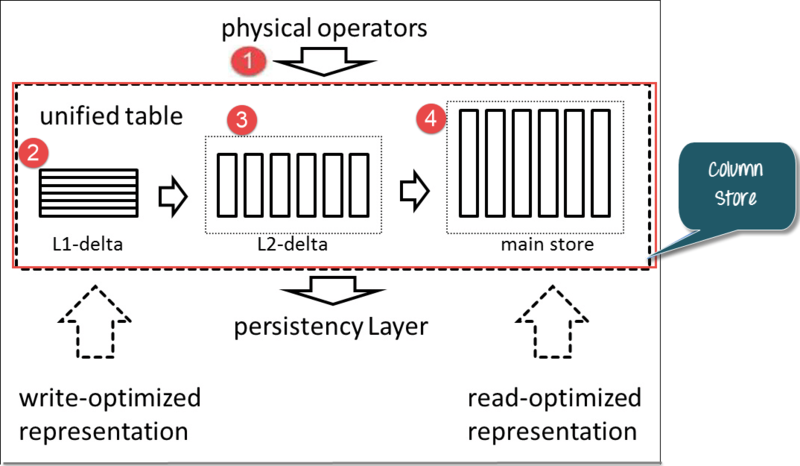 Read and write operation performance optimized with below two data structure. Main Storage contains the main part of data. In Main Storage, suitable data compression Method (Dictionary Encoding, Cluster Encoding, Sparse Encoding, Run Length encoding, etc.) is applied to compress data with the purpose to save memory and speed up searches. Delta storage is optimized for a write operation and uses normal compression. The write operations are not allowed on main storage but allowed on delta storage. Read operations are allowed on both storages. 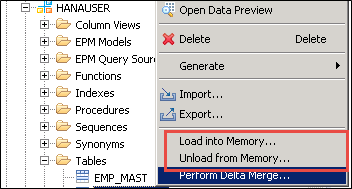 We can manually load data in Main memory by option “Load into Memory” and Unload data from Main memory by “Unload from Memory” option as shown below. Delta storage is used for a write operation and uses basic compression. All uncommitted modification in Column table data stored in delta storage. The purpose of delta merge operation is to move changes, which is collected in delta storage to main storage. 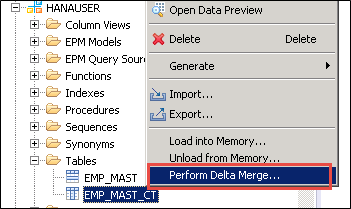 After performing Delta Merge operation on sap column table, the content of main storage is saved to disk and compression recalculated. There is a buffer store (L1-Delta) which is row storage. So in SAP HANA, column table acts like row store due to L1-delta. The user runs update / insert query on the table (Physical Operator is SQL statements.). When L2-delta process is complete, data goes to Main storage. So, Column storage is both Write-optimized and Read-optimized due to L1-Delta and main storage respectively. L1-Delta contains all uncommitted data. Committed data moves to Main Store through L2-Delta. From main store data goes to the persistence layer (The arrow indicating here is a physical operator that send SQL Statement in Column Store). After Processing SQL Statement in Column store, data goes to the persistence layer. Table data is stored on disk in linear format, so below is format how data is stored on disk for row and column table. Data is stored column-wise in the linear format on the disk. Data can be compressed by compress technique. So, Column store has an advantage of memory saving.